Small Farmers Development Job Written Result 2016 has been found my website https://dhakajobs24.com/. 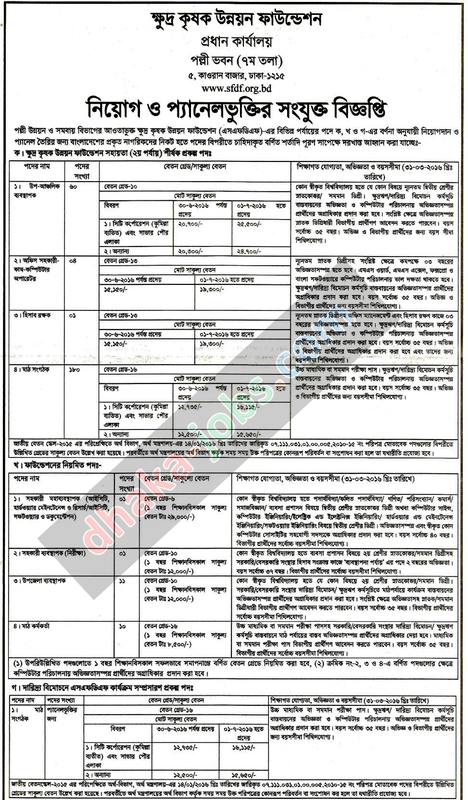 Small Farmers Development Foundation (SFDF) also published this job circular in their official website http://sfdf.org.bd/. Small Farmers Development Foundation (SFDF) Job is the most smart and attractive job in Bangladesh. Small Farmers Development Foundation (SFDF) is total job vacancies two hundred sixty nine (269). Small Farmers Development Foundation is job application deadline 24th March, 2016. Interested candidates are applying this job position and also application charge fees are include in favor of Small Farmers Development Foundation (SFDF) Sonali Bank Ltd. Kawran Bazar Branch, Dhaka. ■ Job Title: Chief Regional Manager, Office Assistant, Accountant, Field Organizer, Assistant Directorate General (ICT), Assistant Manager (Audit), Upozila Manager, Field Officer. ■ Job Description: This job position is experience, talented of Collection and analyses of authority for further review and selection purpose. ■ Compensation and Benefit: As per Government Pay-scale (8th Pay-scale). ■ How to Apply: Apply with full Resume to Managing Director, Small Farmers Development Foundation (SFDF), Head Office Polli Bhabob (7th Floor), 5 Kawran Bazar, Dhaka-1215. ■ Age Limit: 30 years and 32 Child of Freedom Fighter. Small Farmers Development Foundation (SFDF) published a job circular 2016. Small Farmers Development Foundation (SFDF) is very attractive job circular of all Job Searching candidates. Now you can apply this job Vacancies.